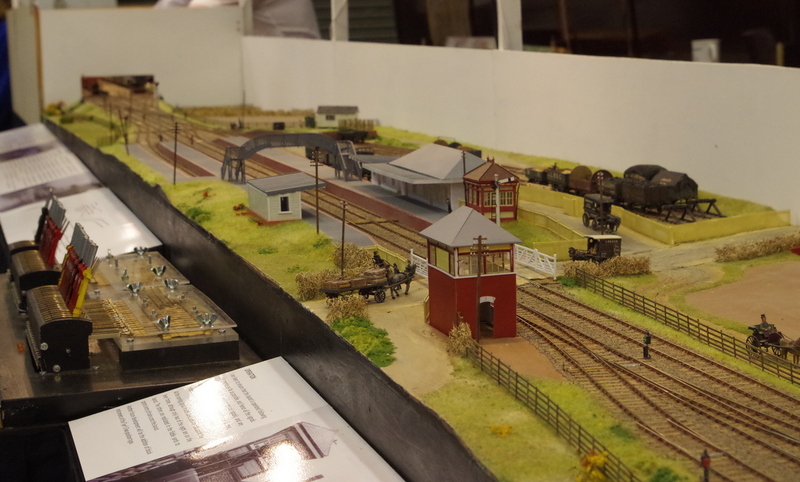 The most serious was that the transition track onto the ‘London’ fiddle yard doesn’t work. The problem is that my cassettes are a little wider than the centre-to-centre track measurement, so the lines have to be slewed to accommodate the width of the cassettes, and to allow two to be set up without touching (and shorting). This necessitates a short length of transition track on the fiddle yard. I basically got the geometry wrong, so that buffer locking occurred - principally with the double-ended push-pull set. The photo shows the arrangement (after I had fixed the problem). I’ve also now finally, finally decided to operate the layout from both sides - signalman, with interlocked lever frame at the front, with fiddle yard operators/drivers at the back. 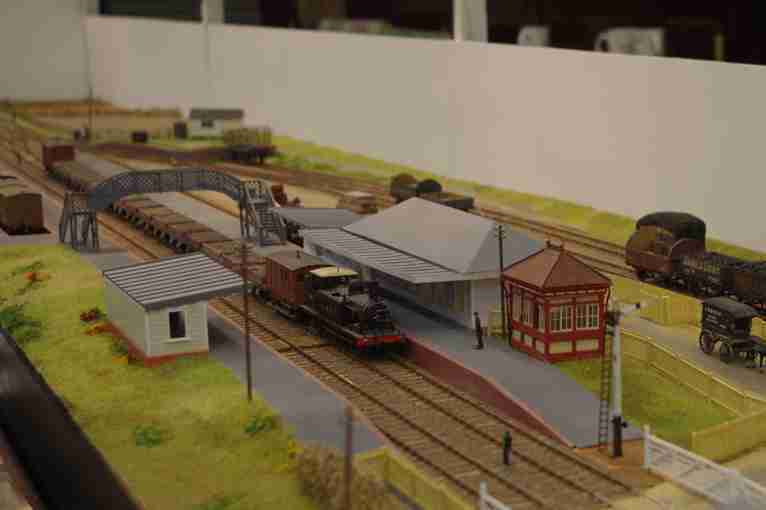 This shows off the lever frame, and also allows the drivers to walk freely from one end of the layout to the other if they need to, without falling over the signalman or getting in the way of the spectators. However, it means building a subsidiary control panel to be operated by the shunter at the back of the layout, with levers and buttons for the four turnouts in the yard. A day’s work and I’ve done enough to make it work, but there’s more to be done to finish it. Another minor job involves taking the rear panels off the fiddle yards, and putting them on the front, so that the yards can be operated from the back. 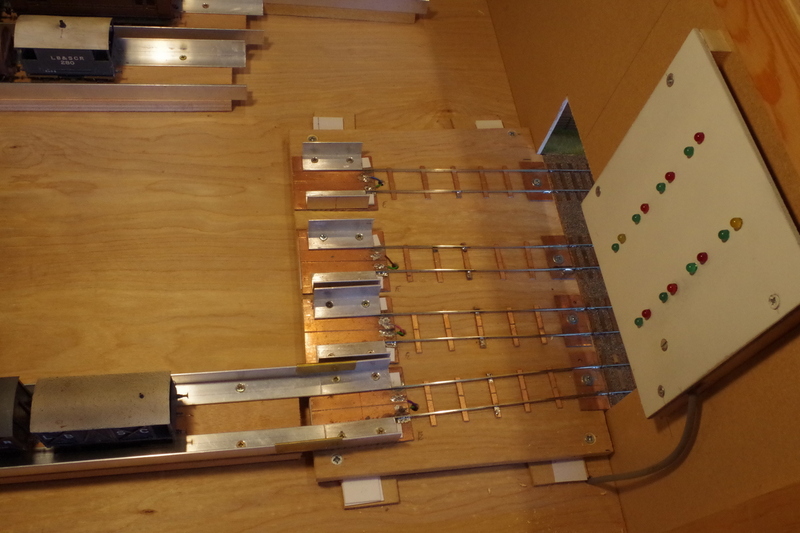 One final job to be squeezed in is the making and wiring of the second set of signal repeaters for the ‘Lewes’ end. So a few hours work to get things sorted before the Bluebell show (first public outing) in a week’s time. June 28/29th - Another week-end, another van to hire, load, unload, and a layout to set up. One important item that we still don’t have is a timetable or sequence. On a visit to the Bluebell shop last week, I found a secondhand copy of Bradshaw’s 1910 timetable - very opportune. I already have a copy of a working timetable (albeit 1918), and putting the two together I am amazed to find out that there were about 70 movements through Plumpton on a typical day - ie excluding race traffic. I can’t replicate the entire timetable, but there are a few interesting workings - the Newhaven Boat Train, an express from Eastbourne, a motor train working to East Grinstead via Horsted Keynes, to mention a few. On the goods workings, there are several through goods with just 25 minutes allowed between Lewes and Keymer Junction, a few with 35 minutes allowed, but only one with over an hour - a local goods working between Haywards Heath and Lewes. Twenty five minutes doesn’t allow enough time to shunt at either Plumpton or Cooksbridge. My conclusion from this is that there is just one working during the day to shunt the yard and arrange various wagons ready for collection, whilst the other workings with 35 minutes allowed have just enough time to pick up and drop off a couple of wagons. This is something which can be replicated in the operating sequence. Martin Nield has come down from Derby to operate over the weekend, so after a couple of hours between us, we have a workable sequence. The show went well, with a great team of operators, and lots of interested spectators. We had a few derailments, but perhaps less than might be expected, a couple of tie-bars which failed (but not disastrously) and a few AJ couplings which require a little further adjustment. Not bad I think for a first outing. 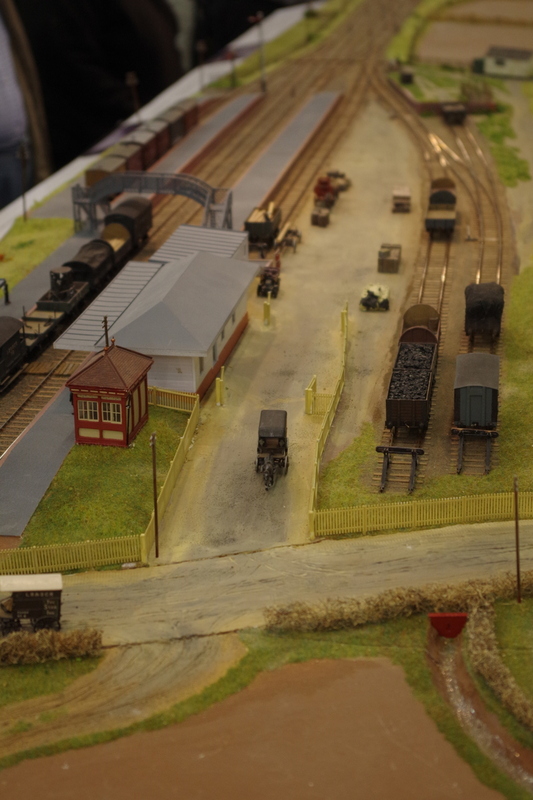 One of the best things about building a layout of a real place is the number of people who remember it as it was - obviously not from 1910, but from the 1950’s onward, when it was substantially unchanged. Thank you to all those who contributed snippets of information. One thing I didn’t do at either S4AGM or the Bluebell was find time to take some decent photos - apart from the rather out-of-focus examples on this page. Here are some more photos taken subsequently. So what next? 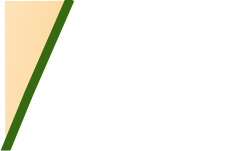 Having now got the layout to an exhibitable standard, improving it and ‘finishing’ it seems like a new project. Lots to do - finish the operational and presentation aspects of the layout (bells, and fascia), and then work on the scenery and buildings I think. July and August 2014. 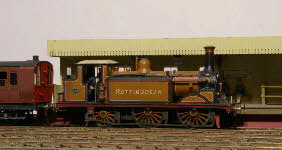 After a fairly hectic May and June getting the layout ready for the Bluebell MRS, things have been a bit quieter. However, we’ve taken the time to fix a few problems which became evident during operation - a few bits of undergauge track (why? - it was all built using S4 gauges! ), plus some minor improvements to turnouts, and perhaps most importantly, improvements to the baseboard joints onto and off the fiddle yards. Every layout I’ve been involved with has had problems in this area - why is this so much more difficult than the other baseboard joints? One area which needs a little more attention is track around the loading dock. Despite my best endeavours to make sure the baseboard tops are absolutely true and flat, the short length of track adjacent to the dock slopes down towards the yard sidings. The slope is only a millimetre or two over about a 150 mm length of track, but it means that wagons run away, instead of staying put - not sure what to do about this, but it definitely needs a solution. We’ve also taken the opportunity to add a few mini dioramas - sheep and shepherd, cows and cowherd, a couple of boys playing in the stream, and the goods yard, plus a lot of work on trees and hedges. Perhaps most noticeable is the new fascia, with letters cut out of hardboard, painted and glued to the ‘pelmet’ to mimic an LBSCR running-in board.